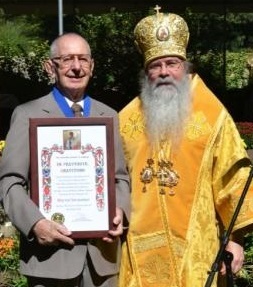 Metropolitan Tikhon awards Order of St. Romanos to Walter Shymansky in 2014. Walter Shymansky, 90, one of four noted Church musicians who had been awarded the Orthodox Church in America’s Order of Saint Romanos in September 2014, fell asleep in the Lord on Sunday, March 31, 2019. Born on July 29, 1928, the son of Archpriest Walter [later Bishop Peter] and Matushka Emily Shymansky, he enlisted in the United States Air Force after graduating from Olyphant, PA High School in 1946. He served as a Control Tower Operator in the Pacific, primarily in Guam. After his honorable discharge, he received a Bachelor of Science degree from Stroudsburg, PA State Teachers College. He also earned a Masters degree in School Administration and Guidance from Pennsylvania State University. A gifted instructor, he taught Biology in New Jersey schools, including a 26-year tenure at Teaneck High School. Walter attended Saint Vladimir’s Seminary, where he pursued evening classes in music and conducting, after which he served various parishes in northern New Jersey and southern New York. He also was a member of the Capella Russian Male Chorus for 29 years and served as its conductor for a decade. Upon retirement, he and his wife relocated to Cohoes, NY, where he was asked by local clergy to organize the Saint Andrew’s Brotherhood Choir. In addition to serving Saint Nicholas Church, Cohoes, NY, he also directed the choir at Saint Nicholas Church, Pittsfield, MA and taught at Saint Tikhon’s Orthodox Theological Seminary, South Canaan, PA. He maintained an extensive repertoire of liturgical music, much of which is available on the Podoben website. Walter is survived by his younger brother, Russell; nieces Arlene [Richard] DeWitt and Donna [Roger] Moyer; and nephews William and Gary Rusen. Visitation will begin at Saint Nicholas Church, 67 Saratoga Street, Cohoes, NY at 5:00 p.m. on Friday, April 5. At 7:00 p.m., His Emininence, Archbishop Michael will celebrate a Requiem. Funeral services will be celebrated at 9:30 a.m. on Saturday, April 6, followed by interment in Saint Nicholas Cemetery.